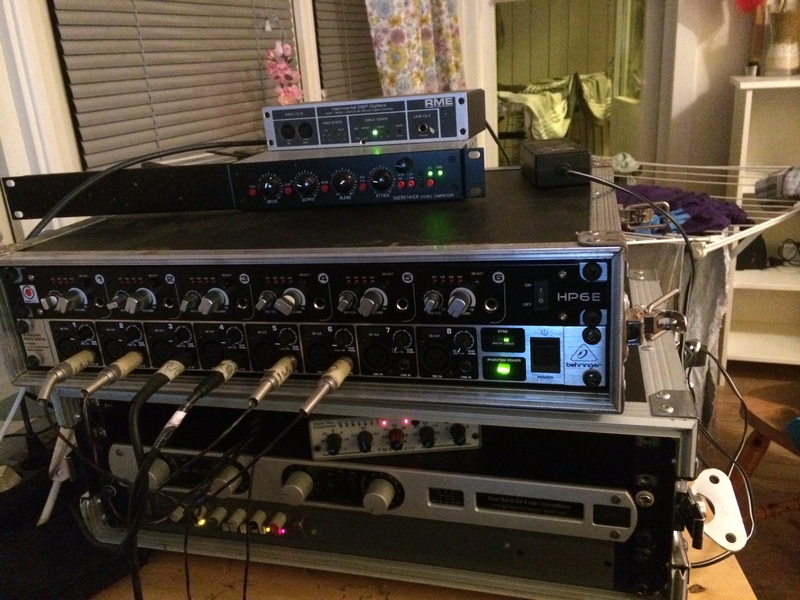 I’ve bought some new analog stereo-compressors, so I wanted to carry out some tests to see if they will really make a difference when I work as a concert-sound engineer. The truth is, working in this digital world I don’t really need analog compressors, unless of course my new boxes sound considerably better than the standard compressors that are included in the most common digital mixers. I wanted to test them compressing the drum-submix, as I feel that this is where the quality of the compressors can make the most difference. The debate goes on whether you should compress the individual drums or all the drums together, but for me the obvious answer is to do a little bit of both. For example, if the drummer can’t keep a consistent level on the snare-drum, try some compression on the snare.. but if you over-compress it the snare may loose its impact, and you bring in a lot of bleed from the other instruments into the snare-mic, particularly from the hi-hat. By letting 2 compressors share the job, you don’t need to push each compressor that hard, meaning you are less likely to get compression-artifacts. And the hi-hat bleed from snare-drum mic will be less of a problem because the bus-compression don’t vary the level between the individual drum-channels. Besides, drum-buss compression can bring its own unique sound-caracter thats hardly achieved any other way, a certain “glue” to the whole drum set, the feeling that only one drummer is behind it all. And this is perphaps where you really see the “personality” of the compressor..
Ok, lets unveil the mystery, bring in the audio-clips! (to paraphrase the famous football-commentator Ivar Hoff: “nothing in this world is as honest as real audio-examples.”) I use the same guinea-pig as with my channel-strip test; the concert from the up and coming Norwegian indie-rock band. this is the “dry” drums, i tried to leave it as unprocessed as possible, only a couple of DB compression on the snare-mic. it think you can hear that the fairchild-compressor is smoother and more consistent where the Dyn3 is pumping in a non-musical manner. perphaps not as smooth and unrestrained as the Fairchild, you can hear the compression, but unlike Dyn3 the “pumping” is tighter and more coherent.. now the Dyn3 sounds out of control. After repeated listening, I notice that the cymbals sounds a little distorted on the Fairchild, whereas the RNC keeps the high-end more natural. my initial thought is that i left the compressor in bybass-mode, cause i can’t hear it working.. but after comparing it to the dry-sample, the snare-drum hits don’t stick out that much and the dynamics are more under control. The “super-nice mode” does the job unobtrusively but perhaps thats too boring for my taste? 2. dry/wet control makes parallel compression possible. With these two features enabled, the signal coming out of the box is compressed but still very punchy, and it brings out the nice ambience from the drum set. To get the most out of this compressor I also used its limiter to shave off some peaks on the snare.. I really like how the bottom end and the bass-drum sounds through this compressor, it sounds big and powerful, even when I push the compressor more than I usually would, in fact its almost as the bottom becomes bigger the more I push the box. Its a very pleasing, coherent sound signature, tight and musical. The analog-boxes are useful, they still beat the default digital compressors. (but if they beat plugin-emulations of analog gear thats another story.. anyway, thats not so important for me cause I don’t have access to them when I work in the field) I can use the RNC if I want some really transparent compression, and the Calrec or the Overstayer is another trick up my sleeve.. however, all things considered, how much does the drum-compressor really matter if I use it more conservatively, as i normally would? Because I already bought these boxes its easy for me to justify it afterwards. We all knew that I would end up defending my opportunistic investments. In fact, why am I even spending time writing this review? .. when I could be out in the sun or be less ambitious and watch Tour De France on television.. todays stage 12 is a chance for Peter Sagan to strike back and win the sprint. Sagan has been very close to winning so far in the Tour, particularly on stage 7 where only the photo-finish could separate him from the winner Matteo Trentin. Afterwords some people calculated that the difference between them was so small that Sagan would have won if he only had worn the new type aerodynamic helmet. For some reason Peter Sagans team was not on the cutting edge of helmet-technology, and this lost them the victory. I listen to the sound-examples again, and think that the subtle differences between the DYN3 and the Calrec sometimes really do matter, and, some beautiful day, the Calrec compressor will be my aerodynamic helmet in this nerdy field of sound-engineering. ‹ Will my new boxes really improve the sound?